5K run, a parade and much more. The event is held on the Grant County Courthouse Square. Contact Tina Hurtt at the Chamber office. If you would like to participate as a Amusement Vendor, please fill out the application. If you would like to be a participating concessionaire, please email us your information. If you would like to participate as a vendor, please fill out the application. Pageant Date: Saturday September 28th,2019 1:00 p.m. Entry Deadline: September 19,2019 - 6:00 p.m.
September 22,2018 from 2:00 p.m. - 6:00 p.m.
All entries must be typed, no written enteries will be accepted. Entry Deadline: October 4th, 2018, 5:00 p.m.
October 5th, 2019 at 8:45 a.m. Entries not received by the deadline will be placed at the end of the parade. 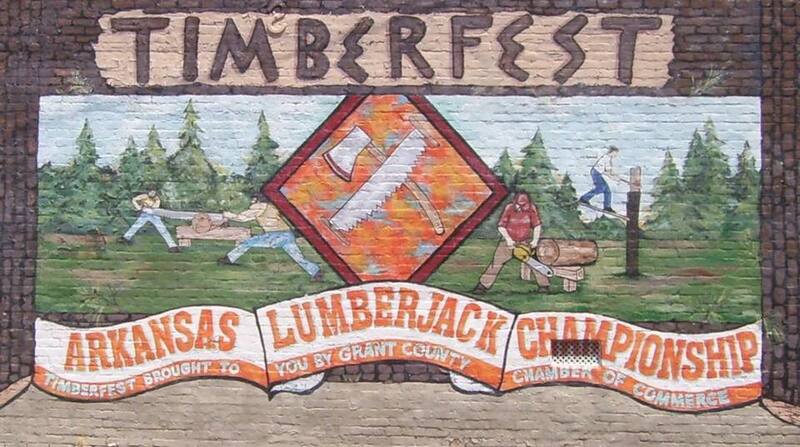 The Arkansas State Lumberjack competition is held each year in Sheridan during our Timberfest celebration. Lumberjacks come from all over to compete against each other, and local lumberjacks, for points and prizes. Each year, we have a large number of wonderful exhibitors who bring their cars and trucks for display and competition. The Car Show will be held on Saturday, Oct 5th. The Timberfest 5K Run is October 5th and is on a back course which winds through the residential area of Sheridan. It is a moderately challenging course with periodic rolling hills offering a unique walking experience. Traffic will be controlled. Trophies will be awarded to the overall male and female winners. A Bow Shoot will be held on Saturday Oct 5th. The Pinewood Derby contest begins at 10:45 a.m. - 11:45 a.m. on Saturday Oct 5th.